The Housing Opportunity through Modernization Act (H.R. 3700) was signed into law by President Obama on July 29. This law will act to ease restrictions on mortgage financing for condominiums. The law reforms the process used by the Federal Housing Administration (FHA) to determine if condominium unit owners will be in a position to qualify for FHA insurance. In 2009, FHA changed the rules for qualifying for insurance, leaving most condominium home buyers without the opportunity for FHA insured mortgages. The new law will result in some improvements for home buyers who view condominiums as an affordable housing option. Under the new law, the FHA must issue guidance regarding the percentage of units that must be occupied by owners in order for the condominium project to be eligible for FHA mortgage insurance. The current requirement is 50 percent owner occupancy. In the event the FHA fails to issue guidance within ninety days of the effective date of the legislation, the required percentage for owner occupancy automatically becomes 35 percent. The new law amends the National Housing Act to modify certification requirements for condominium mortgage insurance to make recertifications of condominium projects substantially less burdensome than original certifications. The FHA is required to consider lengthening the time between certifications for approved properties and allowing information to be updated rather than resubmitted. It will be interesting to see how the FHA implements the new law. Changes to FHA regulations and existing agency guidelines should be expected soon. The National Association of Realtors has been a proponent of the new law and praised its passage in a press release as a victory for real estate agents and home buyers. This law affects housing in other ways. It modifies HUD’s rental assistance programs, including Section 8 low-income (voucher) and public housing programs. 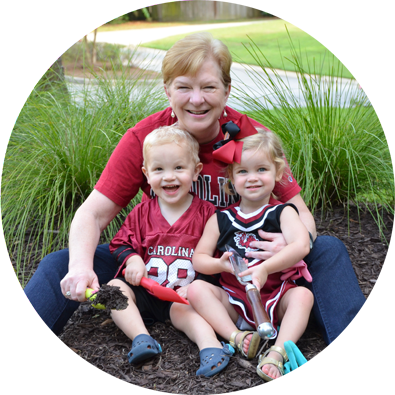 In addition, it modifies the Department of Agriculture’s single family housing guaranteed loan program. The expectation is that the new law will make home ownership for first-time buyers (and old King Tut in his “condo made of stone-a”) a little easier in the current economic environment. The Research Department of the National Association of Realtors® surveyed members in August about their awareness and preparation for the changes in residential closings being implemented by the Consumer Financial Protection Bureau in October of 2015. The most dramatic change is eliminating the current disclosure forms in favor of a Loan Estimate and Closing Disclosure, collectively called the TILA RESPA Integrated Disclosures (TRID). The results of the survey were detailed in an Executive Summary entitled “TRID: REALTORS® and the New Closing Process”. The best news from the report is that 71.2% of the respondent members rated their level of preparedness as average or better. Many stated they are taking action and working with their industry partners to prepare for a smooth transition. More than 80% of respondents indicated they have taken some form of TRID training. Dirt lawyers should expect to see changes in residential form contracts. More than half of respondents indicated they will adjust contracts to reflect longer closing time frames, and almost a third indicated they plan to adjust contracts to include new contingencies. 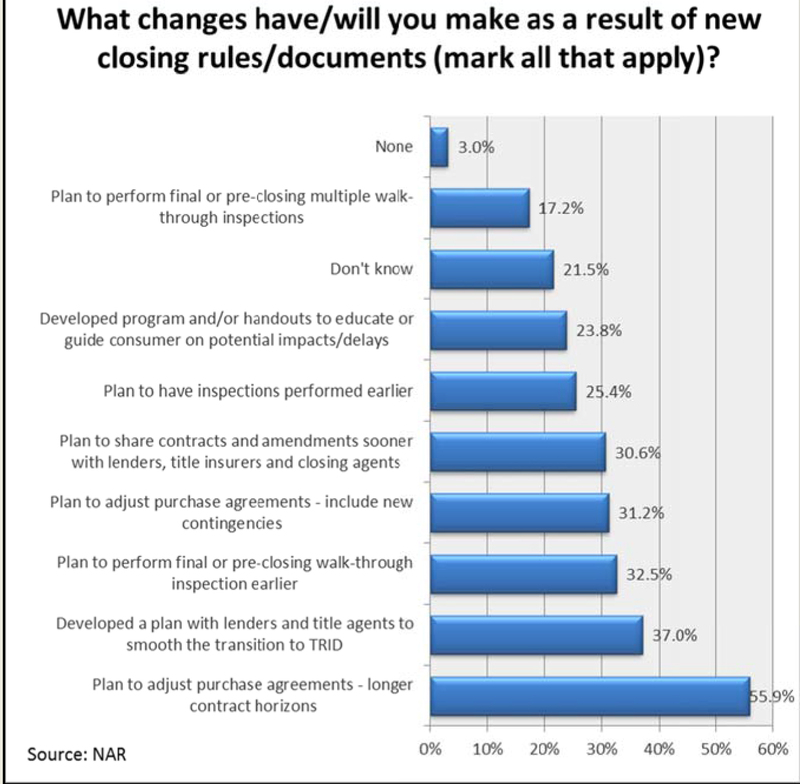 Take a look at the following chart for more information on how Realtors® plan to deal with the new rules. Although it is anticipated that the changes may introduce new burdens on lenders, closing attorneys and REALTORS®, many of the respondents indicated the number of delayed closings has been low in the past, and they will continue to work with their industry partners to help make the transition smooth. Real estate lawyers who have not reached out to their REALTOR® contacts should do so soon and often to assist with the transition!